We’d love your help. Let us know what’s wrong with this preview of Sensation by Thalma Lobel. Like the revolutionary bestsellers Predictably Irrational and Emotional Intelligence, Sensation is an exciting, completely new view of human behavior—a new psychology of physical intelligence (or embodied cognition)—that explains how the body unconsciously affects our everyday decisions and choices, written by one of the world’s leading psychologists. From colors and temper Like the revolutionary bestsellers Predictably Irrational and Emotional Intelligence, Sensation is an exciting, completely new view of human behavior—a new psychology of physical intelligence (or embodied cognition)—that explains how the body unconsciously affects our everyday decisions and choices, written by one of the world’s leading psychologists. From colors and temperatures to heavy objects and tall people, a whole symphony of external stimuli exerts a constant influence on the way your mind works. Yet these effects have been hidden from you—until now. Drawing on her own work as well as from research across the globe, Dr. Thalma Lobel reveals how shockingly susceptible we are to sensory input from the world around us. To ask other readers questions about Sensation, please sign up. does this book read as more of a poppsych or is it for academics? It was okay. Maybe if I was holding something warm when I read it I would have liked it more. В этой книге я проведу вас по миру ощущений и расскажу, как сенсорный опыт воздействует на наши мыслительные процессы, которые мы полагаем рациональными, и на наши решения, которые мы считаем независимыми. Я объясню, почему тепло временно делает нас более дружелюбными, а красный цвет может повредить нам на экзамене. Я продемонстрирую, как две точки, поставленные рядом на координатной плоскости, заставляют нас ощутить более тесную эмоциональную связь с объектом, а резюме, прикрепленное к тяжелому планшету, усиливает впечатление о профессионализме подателя. Я покажу, что запах чистоты (например, жидкости для мытья окон) способствует более нравственному поведению, в то время как душ перед экзаменом может усилить тягу к списыванию и обману. Эта книга – о том, как внешние стимулы влияют на внутреннее восприятие. Невидимые раздражители, с которыми мы незаметно для себя взаимодействуем в окружающем мире, могут заставить нас потерять сон, провалить экзамен или влюбиться. I want to have liked this more than I did but it's not as well written or as heavily backed up as Nudge, The Spell of the Sensuous, Metaphors In Mind or Metaphors We Live By. However it does bridge the gap between the these although not sadly not explicitly. Some interesting studies shared in some nice, if a little repetitive, ways. The conclusions could have been bolder. This was an interesting review of literature concerning how physical/bodily states influence psychological, usually interpersonal, judgments. I don't question the research, but sometimes it surely challenges the imagination. In essence, this book shows that many of our metaphors are not merely metaphors. Did you read all those fascinating books on smart decision-making? Have you trained your brain and think you got the edge now? Well, think again, turns out that our bodies, specifically our senses have quite an input into our behaviour without us even noticing. There is an enormous fluidity between body and mind and there are countless metaphors and figures of speech in our language to demonstrate this: a weight on our shoulders, seeing red, something smells fishy, having a clean conscience, etc. Did you read all those fascinating books on smart decision-making? Have you trained your brain and think you got the edge now? There is an enormous fluidity between body and mind and there are countless metaphors and figures of speech in our language to demonstrate this: a weight on our shoulders, seeing red, something smells fishy, having a clean conscience, etc. Sensory cues are around us all the time, colours, weight, texture, physical space can unconsciously bias our decision making and our evaluation of others. ‘Embodied Cognition’ is an emerging field in psychology and Thalma Lobel describes in her book cutting-edge studies that prove and systematically examine these connections. Because embodied cognitions is so new and much more research needs to be done to tighten it up, some of the studies come across as a bit vague, still, it’s a fascinating topic and it will make you notice and think about your environment in different ways. Quite an interesting book. How the sensation has so much influence on our behavior, emotions and feelings. Theory of EMBODIED COGNITION - that explains how the body UNCONSCIOUSLY affects our everyday decisions and choices. we will unconsciously more open up and show warm attitude toward new people we met, if we hold hot drink. If we still using hard copy for CV and professional resume, use heavier paper to show our seriousness on vacant position we apply. From color to texture will create differ Quite an interesting book. How the sensation has so much influence on our behavior, emotions and feelings. Theory of EMBODIED COGNITION - that explains how the body UNCONSCIOUSLY affects our everyday decisions and choices. From color to texture will create different effect. NICE!!! My ratings of books on Goodreads are solely a crude ranking of their utility to me, and not an evaluation of literary merit, entertainment value, social importance, humor, insightfulness, scientific accuracy, creative vigor, suspensefulness of plot, depth of characters, vitality of theme, excitement of climax, satisfaction of ending, or any other combination of dimensions of value which we are expected to boil down through some fabulous alchemy into a single digit. Очень примитивная книга, информация в которой опирается на весьма сомнительные исследования. На исследования, где принимает участие, например, 40 студентов. Мало того, что взята всего одна социальная группа, так ещё и 40 человек. И таких примеров исследований на 20-60 человек в книге туча. Читать можно по диагонали, ничего не пропустите. Познавательно, но для меня это одноразовая книга. Желания перечитать ее нет. Useful information, not exactly gripping. We all know that when we say someone is "sweet", we don't mean they are literally sweet, or even that they like sweet things. We know that it is a sort of analogy between a person whose personality makes them pleasant to be around, and something which tastes especially pleasant. Thalma Lobel knows this as well. She is, however, asserting that these two different meanings of the word "sweet" are a lot more closely tied together in our mind than we might think. So much so that activating one conce We all know that when we say someone is "sweet", we don't mean they are literally sweet, or even that they like sweet things. We know that it is a sort of analogy between a person whose personality makes them pleasant to be around, and something which tastes especially pleasant. Thalma Lobel knows this as well. She is, however, asserting that these two different meanings of the word "sweet" are a lot more closely tied together in our mind than we might think. So much so that activating one concept (e.g. by learning that the person has a "sweet tooth") makes the other concept more likely to spring to mind (and cause us to think they are pleasant to be around, i.e. a "sweet person"). Ditto for things that are hard and being a hard bargainer, being physically close together and being emotionally close, being physically higher up and being more powerful (aka "high up in the organization"). Lobel's basic thesis here is that our more abstract concepts do not form in the brain out of nothing; they form out of analogies to things that we learned in early life, and most of that was physical sensations. The book is divided into chapters on temperature, texture, weight, color (two chapters, one on performance and one on sexual attraction), contrast, distance, height, cleanliness (lots of associations between moral and physical disgust here), and smells. Whatever one thinks of the basic thesis, Lobel does not stint in providing us with the scientific research to back up her claims. People are more likely to think highly of a resume for an important job, if they are reading it while it is attached to a heavy clipboard rather than a light one. If you use computers to change the jersey color of athletes in a video clip and show it to referees, they are more likely to assign points to the side wearing red than the side wearing blue. Every chapter has multiple different research teams, at different institutions in different countries, demonstrating that the human brain is influence by a lot of things that probably ought to be irrelevant. If you want the other person in a negotiation to be more open to your suggestions, serve them a warm drink. If you want to keep yourself from being too easily swayed by a desire to be agreeable, pick an iced drink. Yikes. I ought not to have to think about what color tie I'm wearing, what temperature drink I'm drinking, and how close I'm sitting to the other person, when I'm having a business meeting. Of course, I am totally free to ignore these things, at least consciously. What Lobel is saying, though, is that just because I am ignoring them, doesn't mean they don't affect how I think and behave. So, was the fact that this book's dustcover was smooth on the front, but rough on the back, influencing my opinion of it in some subtle way? Was I being manipulated somehow? Lobel is a psychologist who is interested in how our senses affect the way we think and links that to the way that we think metaphorically – a new area of psychology called “embodied cognition”. Sounds a bit complicated? Here are some examples to show how straightforward an idea it is: holding something warm makes us friendlier; the colour red makes us anxious; the smell of fish makes us feel suspicion. Yes, really. The examples explored in the book vary quite a lot. Some of them seemed obvious t Lobel is a psychologist who is interested in how our senses affect the way we think and links that to the way that we think metaphorically – a new area of psychology called “embodied cognition”. Sounds a bit complicated? Here are some examples to show how straightforward an idea it is: holding something warm makes us friendlier; the colour red makes us anxious; the smell of fish makes us feel suspicion. Yes, really. The examples explored in the book vary quite a lot. Some of them seemed obvious to me (we equate weight and value, for instance), while others were surprising (touching something cold or hard makes us act more sternly). For me, Lobel certainly achieved her stated goal, which is to make readers question whether their senses are affecting their judgement. Am I agreeing to take on extra work because I’m holding a warm cup of tea? Am I choosing not to give money to that homeless person because they’re wearing black? Is that person genuinely good at their job or is it just that they’re tall? Which is all very interesting, and Lobel quotes a lot of studies rather than just making assertions. The training instilled in me by Ben Goldacre’s Bad Science blog meant I couldn’t help noticing that they’re mostly very small studies, but then it is a fairly new area of research and Lobel is careful to say when further studies back up the findings or when they are still needed. Sensation, is not unlike many books in popular psychology. However it stands apart from other books on the subject in being able to avoid the inevitable trap of becoming 'self-help'. As a result, we have a book that cites studies and their possible implications in a fairly terse manner. I therefore can't recommend this to anyone whose highly familiar with psychology because it's unlikely to relay facts they didn't know. In brief, the author brings the reader through a series of experiments and t Sensation, is not unlike many books in popular psychology. However it stands apart from other books on the subject in being able to avoid the inevitable trap of becoming 'self-help'. As a result, we have a book that cites studies and their possible implications in a fairly terse manner. I therefore can't recommend this to anyone whose highly familiar with psychology because it's unlikely to relay facts they didn't know. In brief, the author brings the reader through a series of experiments and the occasional anecdote, on the human senses. The author contents that The results of the experiments are evidence for a hypothesis known as embodied cognition. The theory states that cognition (mental function) is shaped through aspects of the body. Therefore it comes as no surprise to see that warmth makes us more agreeable, cold the reverse, the scent of fish causes suspicious behaviour etc. the book is also interesting in that she does explain the set up of the experiments and doesn't do what many authors do in simply telling the results. The brevity might be an irritation to people who want more in depth information. But I don't think that's what the author is aiming to do. She merely wishes to inform the reader of the growing research in this area. Basically, all the metaphors people use to describe psychological things are related to physical sensations. So when you say that someone is a warm person, you probably actually feel slightly warmer when they are acting warm. With the reverse also working, which is why hot tea and blankets make you feel accepted and cared for. That was the main new thing, most of the other stuff was pretty bland. If you live in a dark room with no windows, that could make you unhappy! Red means stop! Red means fi Basically, all the metaphors people use to describe psychological things are related to physical sensations. So when you say that someone is a warm person, you probably actually feel slightly warmer when they are acting warm. With the reverse also working, which is why hot tea and blankets make you feel accepted and cared for. This book has a lot of examples of how sensational experience influence our decision making process, a very good small talk issues for your next business meeting or water cooler small talk. The most amazing fact I have realised due to one of the last chapters discussing the effect metaphors has on use. This chapter shows that if we enact metaphors we are more prone to act accordingly. For example: putting two things together makes you better in math (put one and one together). What I found so ama This book has a lot of examples of how sensational experience influence our decision making process, a very good small talk issues for your next business meeting or water cooler small talk. The most amazing fact I have realised due to one of the last chapters discussing the effect metaphors has on use. This chapter shows that if we enact metaphors we are more prone to act accordingly. For example: putting two things together makes you better in math (put one and one together). What I found so amazing is that these findings reveal how our mind makes an image of any thing we know, either we really saw it or not, and that is amazing in my opinion. A book on embodied cognition. Read the uncorrected proof copy. The main message of the book is to expose us to understand how we are unconsciously affected by irrelevant environment in our daily behaviours. However, the chapters are presented in very similar way and made it quite boring to read after the first few chapters. The author also made unconvincing links between her personal experience to her results. As well as many unconvincing statements (correlations vs causations). But, it is my fir A book on embodied cognition. Read the uncorrected proof copy. I may never drink a warm cup of coffee, wear the color red, or wash my hands again without thinking of the psychological effect these things may have on it. The most fascinating thing I've taken with me on the study of embodied cognition is the bidirectional nature of it. The physical world affects how you feel and how you feel alters your physical manifestation. And of course there's that possibly irrelevant chicken and egg question. Likes: the information presented in this book is very interesting & possibly useful. Dislikes: it was rather long-winded to describe every research as was done in the book. That preference is all down to the reader. Having said that, there are so many types of people in this world: those who like details, those who don't, and those who just don't have a single nice thing to say about the books they read. Final Verdict: I LIKED IT. This was fascinating! I will never look at how I make decisions the same way ever again. I might even use this to influence how I go into meetings, interviews, etc. so that I can put my best foot forward and so others will have the best impression of me that I want them to have. Brilliantly written! This book awakens your consciousness on sensations, including Colours, temperature, brightness, smell and taste. By knowing this new science of physical intelligence, you will gain more in every occasion because our daily life is never lacked of sensation. Highly recommended ! This book was interesting but half of it was common sense. The interesting part was seeing that what you kind of know is now supported by studies. So, I guess there really weren't anything surprising. It's was o.k..
Click here to read my full review, on my book blog. 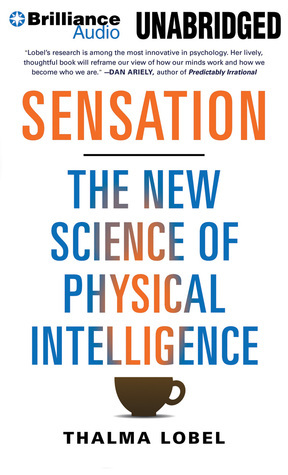 This is a fascinating look at our physical sensation can affect us. The author notes how much work still needs to be done, but it offer a great look at where psychology and biology overlap.